Conversations Among Ruins book launch | Thinking is the enemy. Matthew Peters at Letters Bookshop (photo by Chris Hoerter). 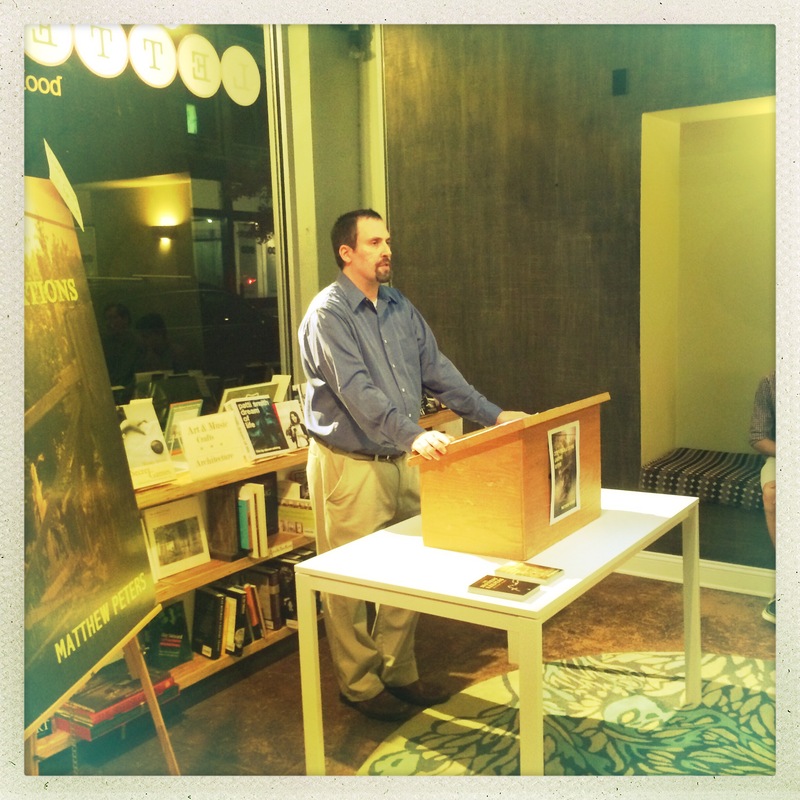 Last night I had the pleasure of attending the book launch party for Matthew Peters’ novel Conversations Among Ruins. Matthew’s publicist, Cindy Campbell, arranged the event at Letters Bookshop in Durham, NC. I hadn’t been to Letters since it opened about a year ago, but I really liked the space. The whole experience, really, was a great opportunity to see independent publishing in action. What do I mean by that? Matthew published Conversations with All Things That Matter Press, a no-fee, royalty-paying, POD small press. Matthew does not have an agent. When Matthew realized he needed help with marketing, he hired his own publicist, who arranged this event, among others. The book launch was at a small, independent bookstore that is making an effort to connect with local writers. Though the novel was originally published as an e-book (available on all the major platforms), Matthew had traditional books available for purchase (and signing!). And all this happened without an agent or a traditional publishing process. Pretty cool. This entry was posted in Books, Marketing and tagged book launch, conversations among ruins, letters bookshop, matthew peters. Bookmark the permalink. Thanks for this, Chris. Your presence made the evening all the more enjoyable.